Ann Fahl's Color and Quilts: How to Fold and Store Quilts! Ann's thoughts on quilting, inspiration and the creative spirit! Feel free to comment. A translate tool is now available for your use! How to Fold and Store Quilts! It's been quite awhile since I taught at a guild in Virginia. Before my lecture, I had dinner with about 6 women, and one of them mentioned how she folded and packed her quilts. She folded her quilts on the bias instead of the the straight of the grain. The bells and whistles went off in my brain--this was the answer on how to safely pack quilts when I teach and send them to exhibits. Of course it also works when quilts are stored in a closet somewhere. Everyone loves "show and tell" at their quilt meetings, I've probably been to hundreds. I could just cry when someone opens up their quilt and there is a hard crease right down the middle in two directions. Once that crease is set, over time, it will never come out. corner across the quilt on the bias. 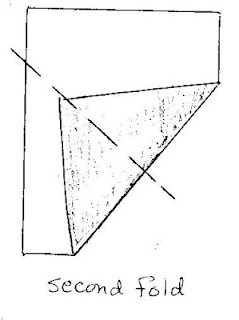 Fold up the next corner, the same way. 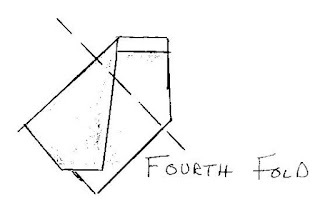 Fold the third corner, the same way. 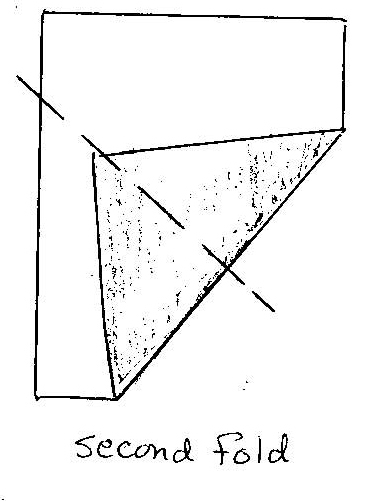 Then fold the last corner as shown. The finished package should look something like this. If the package still needs to be made smaller, fold again much the same way. Or open it up and refold. 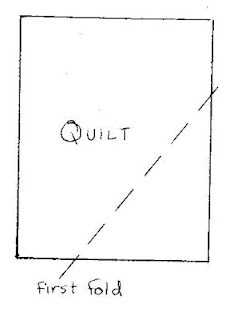 When you open up the quilt after it has been folded like this, the folds will soften and disappear in a very short time. Why? 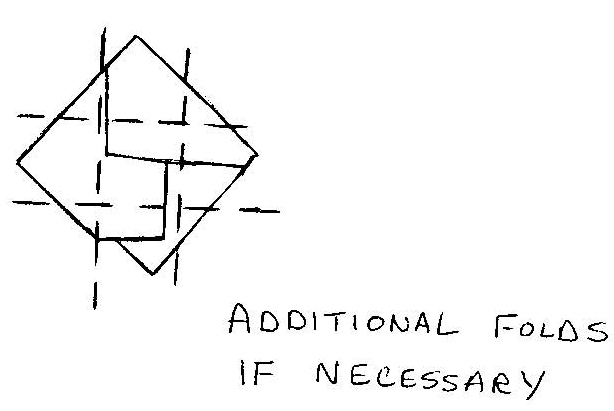 Because every fold that has been made is a soft one, the fibers aren't folded or crimped on top of each other--always at an angle. 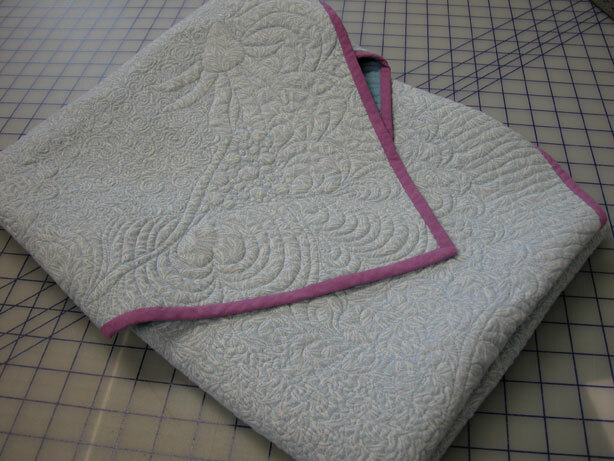 All quilts should be folded on the bias, or rolled to prevent permanent creasing. I heartily recommend this method. When sending to a show, it will arrive without the big crease in the middle, it will look much better. The same goes for antique quilts, it may be too late to "save" some of them from heavy creasing because the damage has already been done. In general even old quilts will be happier folded this way. Practice this a couple of times and you'll figure out how to do this. Even blankets and bedspreads can be folded and stored this way too. Go to your closet and find something to fold! You will be impressed. For a more recent post please see this blog. What a great way to fold a quilt! I dislike those creases and bends in my quilts too, and will have to go refold them right now! Thank you, Ann, I've been folding my quilts this way since I learned it from you. 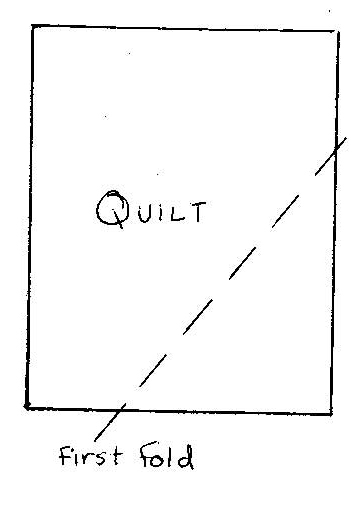 I refolded all the old quilts I have stored on shelves and pass this tip along to everyone I know. Quilters everywhere need to share this tip with everyone they know! Great tips! Saw it on your facebook & shared your link! Great post! I've always folded my quilts to "look pretty" when opened. I guess I'll have to get creative while folding on the bias. Thanks for this info. Doesn't this just produce a crease on the bias fold?? 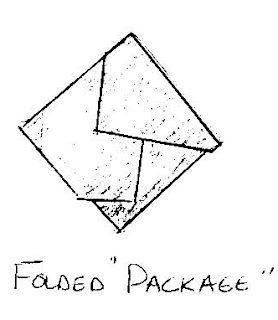 When a fiber isn't folded on top of itself, the fold or crease is much softer. That's why the bias folding works. Thanks for sharing, I posted your link on Pinterest. Wonderful of you to share this nugget of valuable knowledge. 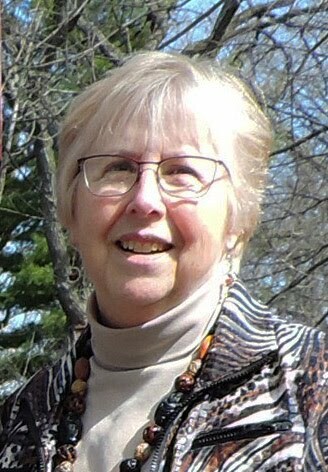 Thank you so much ~ I've shared a link to your blog on Facebook's Quilters Show and Tell page. And I will tell all of my shop customers and students why folding on the bias is important! Thank you! I have just finished my first very big quilt and it took me a year and a bit! It's wonderful to know now already, the proper way to fold! Thank you Ann. Would it be possible, as long as I mention your name, to pass this on to my quilting guild. I would like to make copies and pass them out. Great information! This is such great information I would like to paraphrase it as a "tip", with your permission, in a perpetual calendar book I'm putting together with photos of some of my quilts. 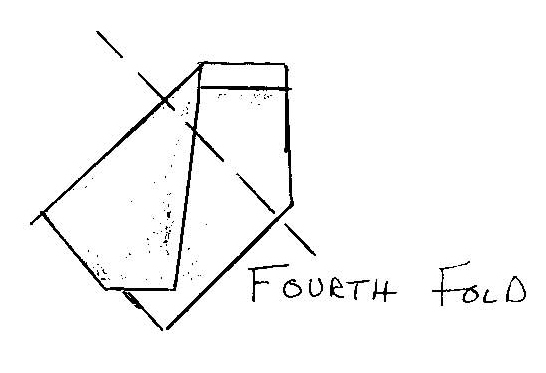 What is the 3rd fold? Did I miss something? A tip I use for remembering how to do this: If you can, get a copy of Ann's article (it's actually in the DECEMBER 2006 issue of QNM not the January). 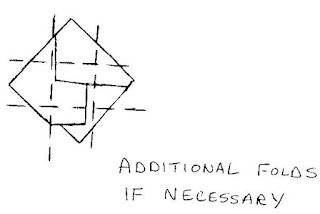 The illustrations in the article very clearly demonstrate the folding sequence (including that third step). Have it laminated at your local copy store and then keep it where you store your folded quilts. This way you never forget how to do it and the laminated copy slides neatly and safely on the same shelf with the quilts. Also consider giving a copy of it to people to whom you give gift quilts (they can laminate it themselves if they wish)! @Anonymous - QNM is Quilters Newsletter Magazine, as it says above. I have always rolled my quilts but find they still get quite creased. I will certainly try this, thanks. 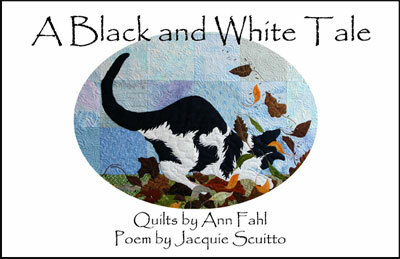 Ann and Jacquie's book about a black and white cat! Now at a new price! Everything you need to know about bias binding plus a small measuring tool! The accomplishment of which I am most proud is the fact that I have published 3 books and one DVD. A Black and White Tale (2011) is self published; the rest are from CandT Publishing. The titles are Dancing with Thread (2010), Coloring with Thread (2005), and Coloring with Thread Dvd (2007). When Your Sewing Machine goes on Vacation! February 15--Remember the Maine Day!